Probably the most anticipated – and hotly contested – elements of any new franchise launch are the team name, logos and uniforms. Ottawa is certainly no exception. 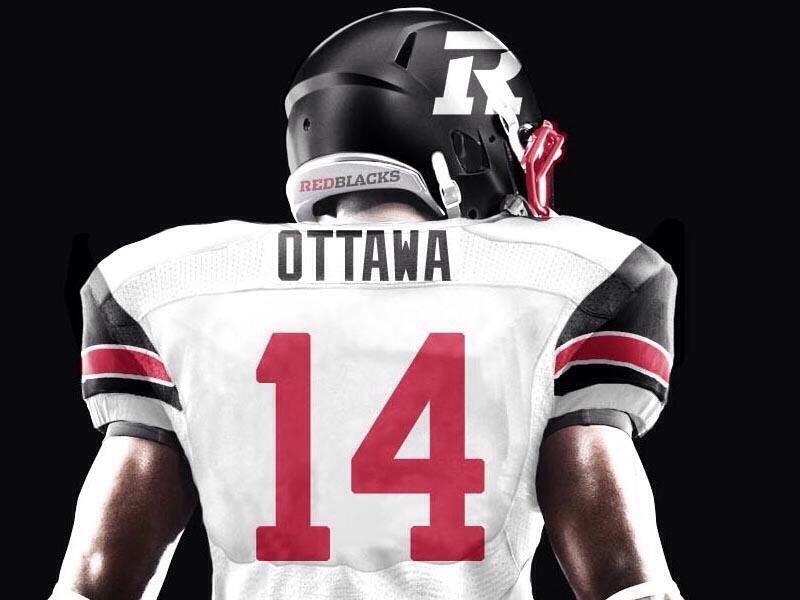 The Redblacks name was met with a mix of confusion (“what’s a Redblack?”), acceptance (“I’m just happy to have football back in Ottawa!”) and (if Twitter is a true gauge of the fan base) intense hatred. The logo, on the other hand, has been pretty warmly accepted. And now, we wait for the uniforms. 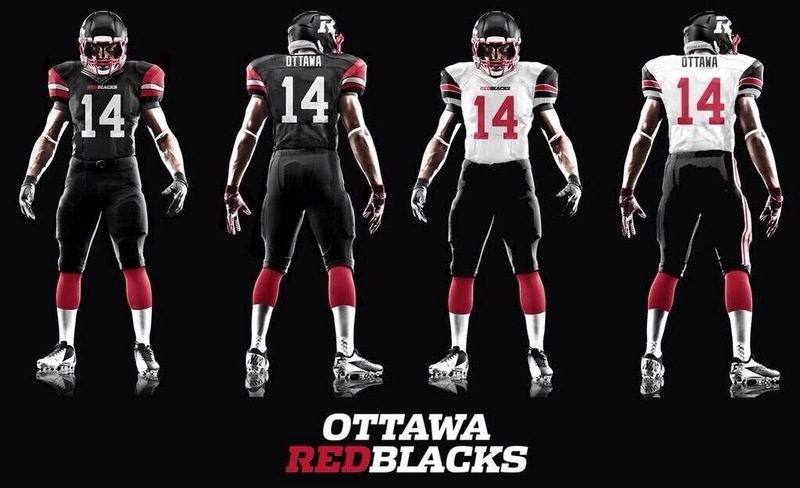 According to Ottawa Sports & Entertainment Group and Ottawa Redblacks President Jeff Hunt, uniforms will be released in April 2014. The original plan was to have jerseys out before Christmas, but looks like Reebok needed more time than anticipated, as they are also releasing all new alternate jerseys for every team. That puts us still a couple of agonizing months away. What is an Ottawa CFL football fan to do? In my opinion, Nelson absolutely knocked it out of the park with this concept. 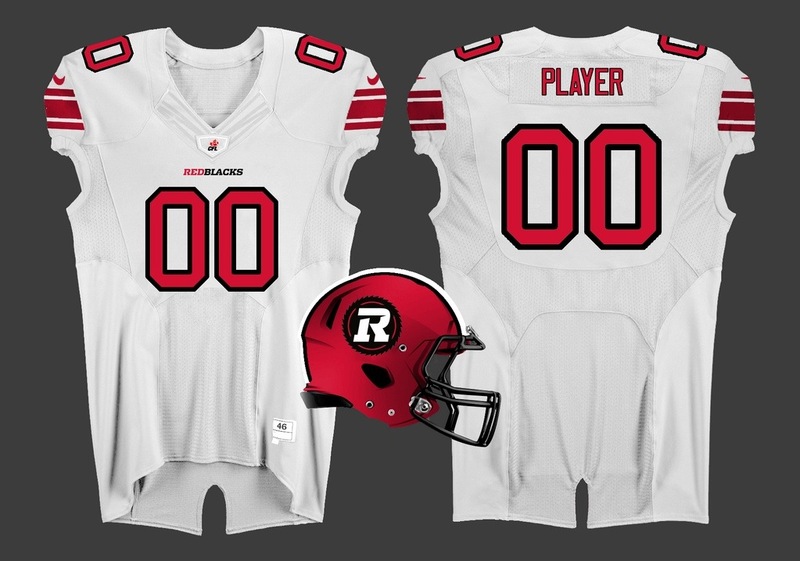 The simple, classic striping on the arms, the Russ Jackson-era red numbers on the white uniforms, the Redblacks ‘R’ alone on a black helmet. Perfection. 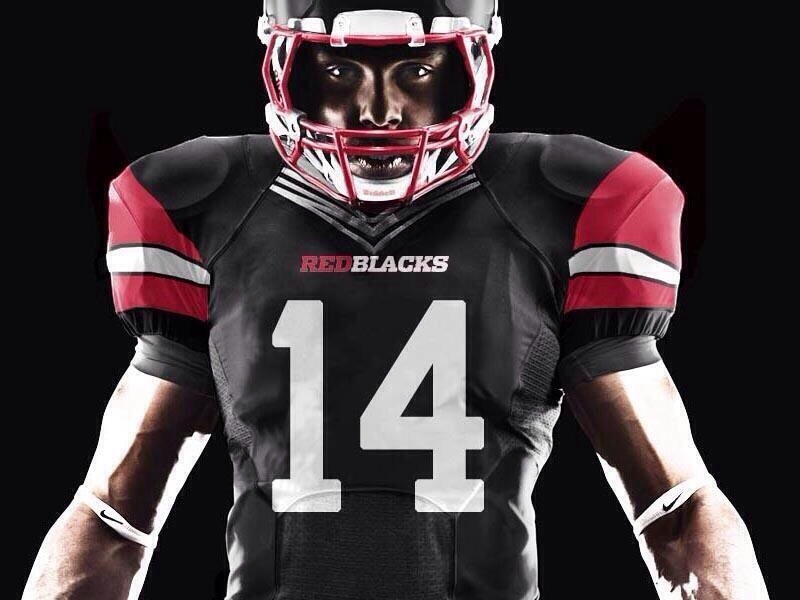 If OSEG land anywhere close to this, I believe they will have one happy fan base. Another great collection with a classic look. This one more 70s/80s-era Riders. I think Nevill is bang-on in expecting a black home & white away, as well as a red alternate jersey right out of the chute. 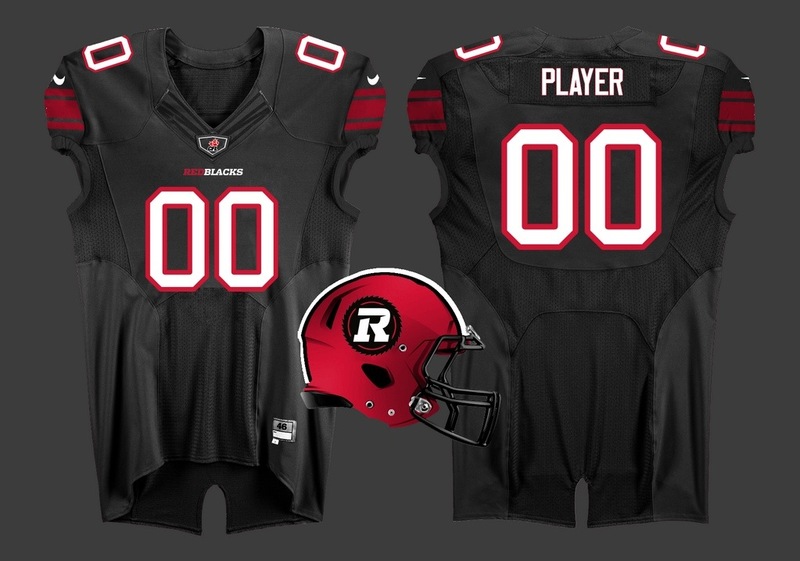 As for an official retro jersey, my guess is the Redblacks wait a year before wearing them, as they will likely want to focus on building their own brand. Also, releasing four different jerseys in the inaugural season seems slightly excessive. What’s not to like about these? Nothing loud or crazy. Just some very well executed uniforms. Simple, clean design, yet still modern. 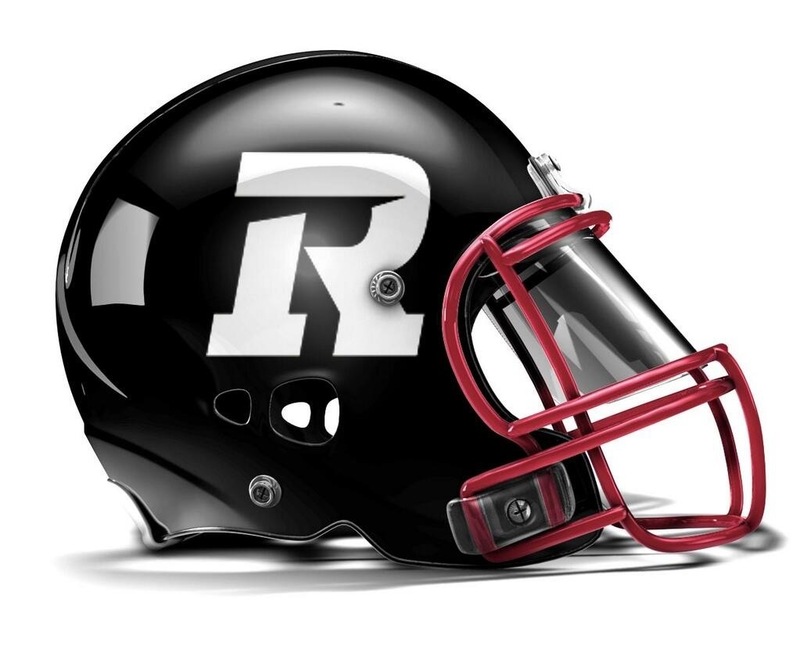 The red helmets look quite good (I liked them more than I thought I would, actually), but my guess is the Redblacks stick with tradition and a black helmet – in year one, anyway. Hopefully this whets your appetite for a little while, #RNation. Kudos to these three talented gentlemen on some great work. I’ll be on the lookout for other concepts in the days ahead as excitement builds towards the official release. 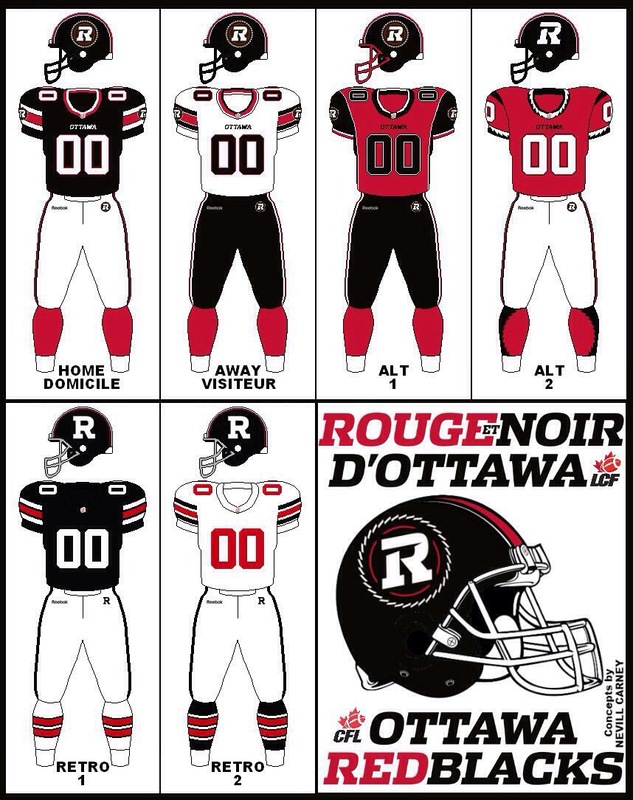 Posted on February 7, 2014 February 9, 2014 by DefendTheRPosted in RedblacksTagged 2014, cfl, jersey concept, ottawa, redblacks, rnation, rough riders. Next Next post: Redblacks jersey numbers?